The next upcoming Purim starts on sundown of Monday March 9 ending at sundown on Tuesday March 10th, 2020. 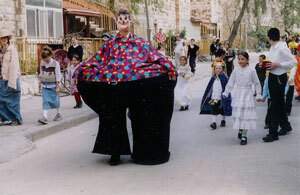 Purim is celebrated on the 14th day in the month Adar using the Jewish calendar. For the Gregorian calendar the day falls in the months of February and March. The day commemorates back in the 4th century BC, when Jewish people were saved from a death decree according to the book of Esther. Jewish people will listen to the reading of the Megilla and the telling of the story of Haman and his plan to kill all the Jews in the empire and Mordecai and Esther who stopped his plans. Many will give to charity on this day as well and send food to those in need. Some schools will have costume events and have carnival type celebrations to honor the day. Back in the 4th century BC according to the book of Esther, Haman was the royal vizier to King Ahasuerus of Persia. Haman decreed to kill all the Jews in the land but his plans where stopped by Mordecai, Esther and others preventing the killing and turning the day into a celebration called Purim.